The object of great desire by collectors of conjuring books-- it is the first devoted exclusively to magic as a performing art. 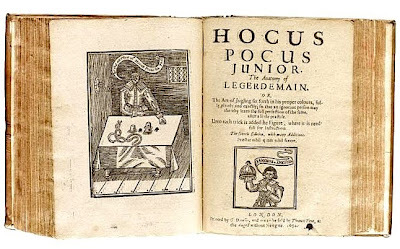 It was based on Reginald Scot's 1584 work on witchcraft, of which more anon. Subtitled '... the art of iugling set forth in his proper colours, fully, plainely, and exactly, so that an ignorant person may thereby learne the full perfection of the same, after a little practise. Vnto each tricke is added the figure, where it is needfull for instruction.' The very rare first edition has 52 pages with woodcut illustrations, subsequent editions were somewhat expanded. There were many editions, even into the 19th century --all are valuable and surprisingly hard to find. Most copies are said to be in instititions. Various modern facsimiles have appeared, mostly now pricey.